The most ancient emblem of the Rurik dynasty was the Trident. The oldest examples of the trident discovered by archaeologists on Ukrainian territory data back to the 1st century AD. At that time the trident probably served as a symbol of power in one of the tribes that later became part of the Rus people. It was then adopted by the Varangian leaders, presumably in the 10th century. The trident was stamped on the gold and silver coins issued by Prince Vladimir the Great (980-1015) and passed to his successors, Swiatopolk and Yaroslaw the Wise. 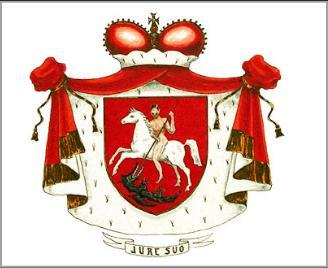 Iziaslaw Yaroslawicz, Swiatpolk II Izaslawicz and Lew Danilowicz used the Bident as their coat of arms. 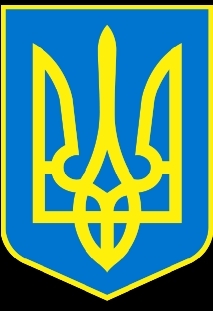 It was replaced as a state emblem in the 12th century, presumably under Christian influence, with the figure of the Archangel Michael killing a dragon with a spear. A similar motive of pre-christian origin was known, most probably imported from the Byzantine Empire, representing a man riding a horse, killing a dragon. This image, sometimes called "St George", took the name of the "Ruthenian pursuit" in Poland. One may assume that the Swiatopolks chose for their shield a variation of the same model and bequeathed it to the Czetwertynskis, who are their descendants. It deptics a naked man on a white horse, striking down a black dragon lying at his feet. 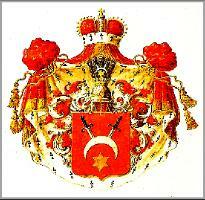 Curiously enough the Swiatopolk-Mirskis, another branch of their descendants, use a different crest. The image of a rider killing a dragon probably originated in the East Mediterranean area, possibly the Middle East. A very popular symbol, it has spread as far as Northern India. It probably had a mythological meaning, dating back to the pre-Christian times, that has been lost. In Europe it has often been the representation of St George, whose historic traces are unknown. Some theories suggest that as, etymologically, 'George' refers to a man who cultivates land, St George might be the symbol of sedentary tribes or clans, as opposed to nomads. According to an old Russian legend, the myth of St George was brough to Russia in the third century A.D. by a Greek prince called Theodor who was fleeing the Romans and who founded the settlements that later became the cities of Kiev, Vilnius, Moscow and Jaroslaw. In the 16th century, another emblem, of polish origin, was added to the first one. On a shield of gules, two swords are buried guard-deep in a silver moon crescent, the points oriented downwards. Awarded by the king of Poland for great deeds on the battlefield of the eastern "boundaries", with its floating borders. It mostly had a military usage, on the insignia of the family regiments. Russia's considerable expansion by conquest and annexation of large territories, reached its peak at the end of the 18th century. It required the assimilation of the conquered populations by integrating them into the "great russian" hierarchical structure. It was particularly important for the nobility, who, as a class, still had in the feudal regime, a particular status and privileges. The fact of belonging to the nobility, which up until then was governed by tradition and customs, without great strictness, became regulated. An official verification of proofs of nobility was conducted, as well as the homologation of the arms attached to the russian and non-native families. This procedure was particularly extended to the polish provinces that had been annexed to Russia, when the country was split in 1795. The Czetwertynski Princes, whose family is associatad with the foundation of the first Russian State in Kiev, had a great deal of property in the ruthenian provinces, including Volhynia, that were attached to the Russian Empire. They where thus submitted to the procedure of recording leur titles and arms. The beginning of the 19th century was marked, in Russia as well as elsewhere in Europe, but an romanctic aesthetic sensibility, that would push some to "enhance" the heritage of the past, when judged too simple or primitve. Later came the wave of "victorian" puritanism, that hated "indecent" representations. It would thus occur that certain russian heraldists would "improve" certain heraldic symbols. That is how the Czetwertynski coat of arms was "retouched" by the St Petersburg Heraldic House, probably to try to make it more "modern" or aesthetically pleasing. The naked man was thus replaced by an elegant knight, and the black dragon was replaced by a golden one. A variation was allowed, allowing to juxtapose both arms on the same shield. On a shield of gules, a naked man riding a silver horse, oriented towards the right, strikes and slays with a spear a winged dragon of sand, laying at his feet. The shield rests on top of a ermine coat, below a princely crown. On a shield of gules, two white swords in sand handles symetrically imbedded in both sides of the upper part of silver moon crescent, points downwards, over a golden six-branch star. Contrary to West European countries, Poland never adopted a feudal political system with its rigid hierarchy. After 1572, following the extinction of the Jagiello royal family, it became an elective monarchy that was officially called a republic and, after the union with Lithuania, "Commonwealth of two nations". The nobility that represented close to 10% of the total population, practically ruled the country with the king. The members of this priviledged class were much attached to their rights and freedoms as well as to a strict equality amongst themselves. Therefore, they always opposed the award by the Crown of titles of nobility which would have reflected differences in actual power or prestige. When Poland and Lithuania formed a federation by the Treaty of Lublin in 1569, the new state recognized the titles of ancient dynastic princely families established on former Lithuanian or Ruthene lands in order to integrate them in the new political entity. This was the case of the Czartorisky, Czetwertynski, Oginsky, Masalski and Sangusko families. The Sejm of 1764 bestowed a princely title on Stanislaw Augustus Poniatowski's brothers, that of 1768 on the Sapieha family, and that of 1773 on the Poninskis. Several families bore princely titles granted by foreign courts (usually the Holy Roman Empire) : Radziwill, Lubomirski, Jablonowski, Sulkowski. Some bore the title of count like Tarnowski, Potocki, Zamoyski, Lackoronski : These were mainly used when traveling abroad. During the partition of Poland at the end of the 18th century until its restoration after the first World War, many families were granted nobility titles as they became subjects of three different sovereigns.